Last week marked the beginning of another Wimbledon tournament, the world’s tennis greats are travelling to the great town of London to take part in this prestigious event. Murray Mount will be covered with spectators all hoping the young British no.1 can bring some glory to our nation and he is doing well so far, and with Nadal being knocked out, he should be confident of achieving a place in the final. As we are all enthralled with the incredible tennis taking place on the immaculate lawns, maybe we should take a little more notice of our own; after all we want to see a lovely, rich, green lawn out of our windows instead of a dry, patchy landscape. Now, we may not be the groundsman at Wimbledon, but we do have some knowledge on creating that beautiful lawn! Here are our tips on how to achieve this. 1. Spring time is the best time to start sowing your seeds and laying the turf. Warm weather encourages growth, but ensure you have applied a weed and moss killer as well as some fertilisers to make sure the grass will remain fit and healthy. Water 3-4 times a week until the seeds begin to sprout. This will give them the best chance of survival. 2. Define the edges to make it look tidy and professional. Any over hanging plants, hedges or trees, try to trim back too. 3. Choose the correct type of lawn mower. 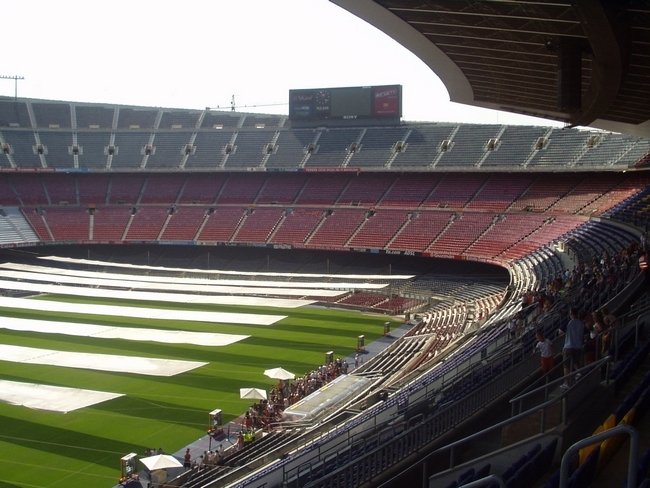 A cylinder mower is great on perfectly level lawns and creates that lovely striped effect like what you would see at Old Trafford or the Nou Camp. A rotary mower will work well even on wet grass and uneven ground. Mulch lawn mowers are handy as they cut the grass, recycling the clippings and layering them across the lawn. As they are already finely chopped by the mower, the clippings will decompose feeding the lawn with vital nutrients. 4. Correct cutting height. This all depends on the time of year and how long you want it. Try not to cut the lawn too short as if you have an uneven garden, you could end up with bald patches, which in turn promotes the growth of weed and moss. During the Summer you should cut the grass little and often. A slightly longer lawn will retain moisture better during the dryer months. Trimming regularly will keep it healthy and looking great for the garden parties you have planned. During the Winter months it will not need mowing until it starts to get warmer again. 5. Aerate your lawn. Using a pitchfork or a spiked object, pierce the lawn as it removes stagnant carbon dioxide, allowing oxygen to re-energise the lawn and promote growth. Aeration helps with drainage and strengthens the turf. 6. 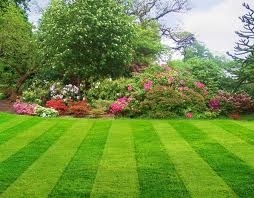 Maintenance of surrounding hedges, trees and plants will help keep the lawn clear and improve its uptake of nutrients. During the Autumnal month’s rake of excess leaves and debris to keep it clear, clean and tidy. 7. Try not to walk over the grass when it is waterlogged or frozen as this breaks and wounds the lawn, exposing it to fungus. 8. Sharp mowing blades will help give you the perfect lawn. If you have a blunt mower blade it will tear the grass resulting in a greyish brown lawn. 9. Prevention is the best cure, so before weeds begin to germinate, spread a herbicide across the lawn. This should control the growth of any weeds popping up, stopping their seeds from sprouting on the lawn. Hopefully, by following this simple advice, you will have a lawn that even Roger Federer would be proud to play tennis on. Failing that you could always put in a patio!